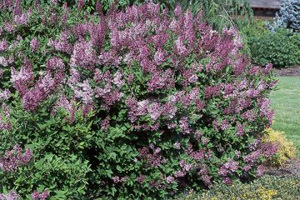 Smaller and more rounded than the common lilac, the Dwarf Korean Lilac reaches 4 to 6 feet high with an equal spread. The 4-inch long, deep lavender flower panicles appear in May and cover the entire shrub for about 2 weeks. They are excellent for cutting and have a delightful fragrance. The petite leaves are dark green and rounded. Provide this mildew resistant shrub with a well-drained soil and full sun for consistent yearly bloom. Size: Height: 4 ft. to 8 ft.
Width: 1 ft. to 5 ft.